Many recipes are complicated and time consuming to make, but recipes don’t have to be that way. Often times I think Americans complicate food. Maybe that is too generalized of a statement, but I really do think we try too hard sometimes when it comes to cooking. 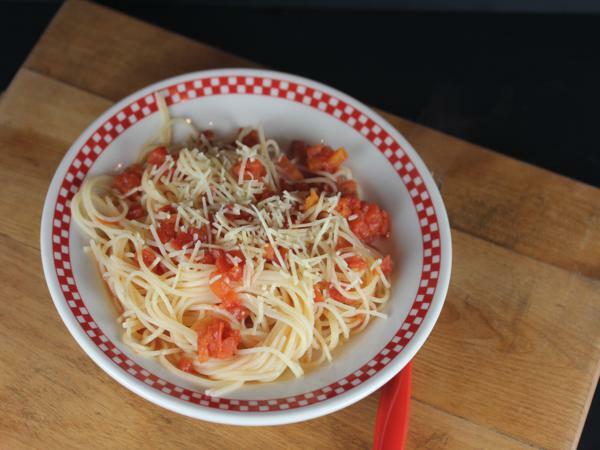 A good meal does not have to be gourmet or contain twenty ingredients. Simple food made with simple ingredients can be good. In fact it often is very good. And simple food is often very inexpensive to make. When a meal only contains a few basic kitchen ingredients it is usually quite inexpensive to make. Today’s recipe for my cooking through my collection series is just they kind of recipe. It is so simple, yet so delicious. And this recipe comes from a cookbook and author that might surprise you. 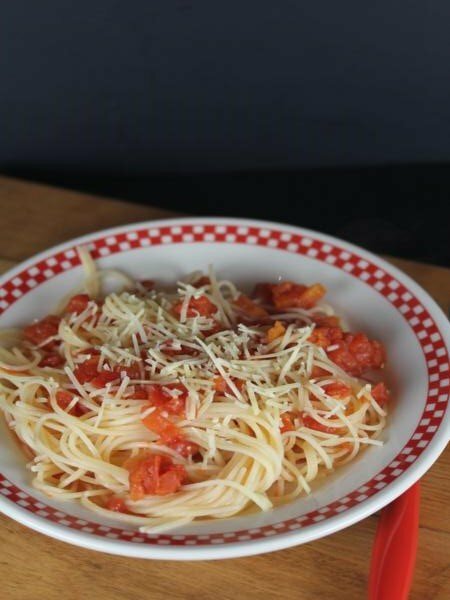 This recipe is for spaghetti with tomato sauce and comes from an old Martha Stewart cookbook. And by old I mean from the 1990’s. Which is not really that old, but it was one of the early cookbooks that Martha did. 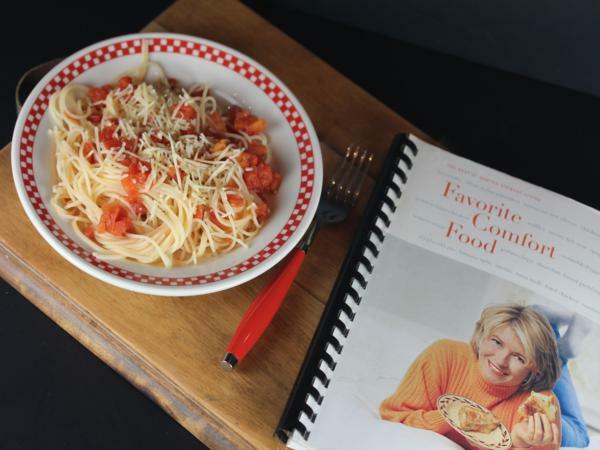 The cookbook is Favorite Comfort Food: Classic Favorites and Great New Recipes . My sister and I both got a copy of this cookbook years ago and we both wore our copies out. I used mine so much that the binding fell apart and I took it in and had it spiral bound so that it would last longer. A few of the recipes in this cookbook are for fancier more gourmet food, but most of the recipes are for classic dishes and meals. My favorite pancake recipe from before I went gluten free comes from this cookbook. One of the first times I roasted a whole chicken was by following the recipes in this book. This is not a large cookbook compared to many. It is only 140 pages, but I think it is a cookbook worth having, especially if you can find a used copy for a great price. Now for the recipe. I have been using this basic recipe for years. 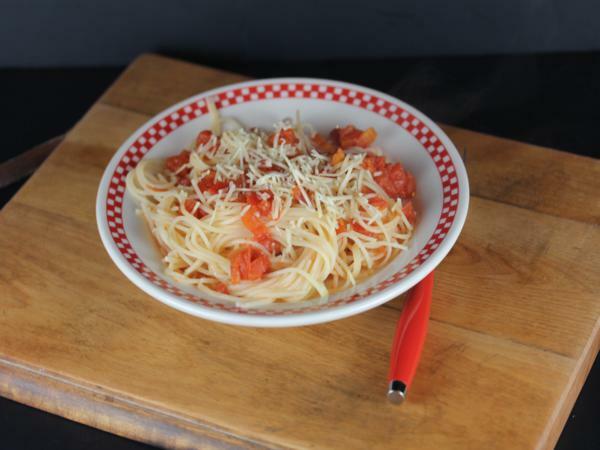 I love it because it is so simple and contains ingredients I almost always have on hand. Over the years I have adapted it slightly, but it is still the same basic recipe. The day I made this to take pictures for this post I just kept it like the recipe says and made it meatless, but I often change it up by adding different types of sausage or even just ground beef. You can also add mushrooms, onions, etc. Really this is one of those recipes that you can take the basic recipe and add whatever you like to it. I love recipes like that! In a saute pan heat oil. Add garlic and stir for 30 seconds or until lightly browned. Add red pepper and salt. Stir. Add tomatoes and stir until well combined. Cook for 5-10 minutes or until sauce has thickened slightly. Cook longer if desired. Just checking — the ingredients list crushed red pepper, but the instructions say red pepper flakes. Which is it? And thanks for offering simple recipes, just as I am reevaluating my menu and trying to simplify more! I meant to put both/either for the ingredients. Either one works and I just use what I have. The original recipe calls for crushed red pepper flakes. I just fixed it in the ingredients. Thanks for catching that and for letting me know so that I could fix it. I hope you enjoy it!